Just downloaded sidepilot because of the mess that is the 3DR Solo app. I bought an iPhone 7 Plus the other day and updated the latest IOS software (10.3). Neither less to say the 3DR Solo app stopped working. 3DR after sales support is shite and so I was about to start thinking about a Mavic Pro. Read on this forum about "sidepilot" which works on IOS. I dropped Tom a line asking if the rumour about live video support coming soon was true. He informed me it already up and running. I downloaded sidepilot and it works! Tom was very quick to respond to my initial e-mail and a follow up. No idesa where he is based but I am in Southern Africa and so if he is in the States he answered when anyone else would be fast asleep. Very happy with the app and not needing to drop $1300 on the Mavic Pro package. Thanks Tom - life saver! Bought the app to get my new Solo off the ground. Is there a PDF Manual anywhere. I would like to read how the app works instead of trial and error. I have just created a User Manual, you can get it from the main website here or from the forums in the How-To section. So, let me get this straight. Is this something similar to Solex but for iOS products? The link goes to the user manual correct. But it only displays the cover page. Yes. I just loaded and tried it. Having a problem with the Live Video Stream Freezing up though at times. 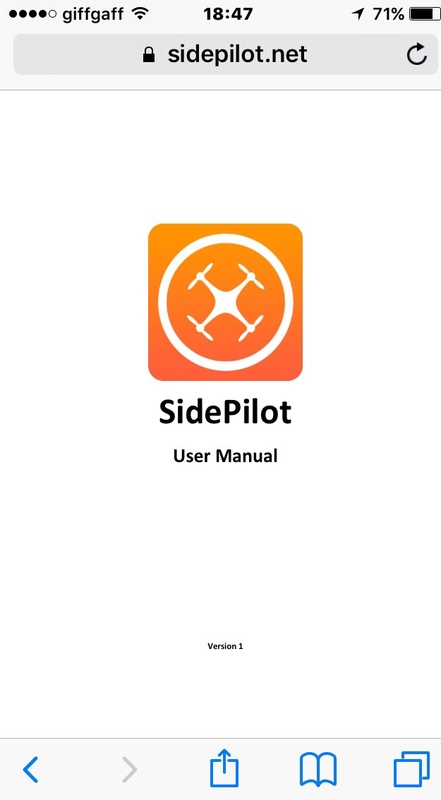 SidePilot is similar to Solex, however we support all APM/PX4 drones, not just solo. Visit the forums How-to section for a downloadable version which will work on iOS. Thanks David, I saw your forum post and will be looking into this. Thanks for letting me know Richard, I'll update the App Store description, must have missed that! We definitely support Solo video! Love the product, but it is not solex, closer to tower for IOS correct? More like Tower in that it gives you more advanced control over settings and is compatible with Arducopter and PX4, however I am currently working on integrating custom smart shots to make it more user friendly and for the basic users out there. thanks, keep up the great work, looking good!!! SidePilot doesn't require cell capabilities (only does if you want to use follow me mode as the non cell iPads do not have GPS, but that can be fixed by tethering to a cell device. Yes it has iOS 9.3.5.. I also see where you made the change in the description. Version 1.22 has just been released! Video and pictures save to camera roll! Revised video stream view. Only in one place, can be made full screen by triple tapping the video in landscape mode. Can declutter the screen by swiping in from the right edge.